Charlie Parker's son, Steve, is compiling a collection of stories involving his Dad, the longtime program director of WDRC. If you'd like to participate, please drop Steve an e-mail. Read Kathy & Steve Parker's memories of Growing Up Parker, here. I have to share something more about Charlie Parker with you - I know everyone at DRC thought he was good. I thought so too - only on a very special level. Charlie Parker was, as far as I am concerned, THE God of all Program Directors, past, present or future. I've had PD's who've stomped their feet and yelled and actually said "watch my lips!" (that guy now drives a rig I am told and chews tobaccy). I had to have a PD restrained for six months by the GM so a morning partner and I could just do our show. I've had people tell me they expect me to write a topical show a week in advance so there are no surprises to them - BUT BE TOPICAL AND CURRENT! I've worked for Plenty 'o P.D. Assholes but I'm privileged and honored to have been able to have worked WITH Charlie Parker. Charlie Parker never yelled at me, never berated me, never went over an aircheck with me, never wrote me nasty notes. In fact never wrote me any notes. He did however, stay real late a couple times a month and because I was always there by eleven we'd get together for chats in his office. We had conversations. We became friends. I asked him about the good ole days and he'd tell me about the Turkey Giveaway where they actually dropped frozen Turkeys over Hartford from Helicopters and how badly that went over cause they just smashed on the ground. We talked about the weather and my life and his kids. We'd talk concerts and records, about things going on, promotions in the works. He'd tell me about what DRC was all about and he would often tell me about its unique place in radio history. He also had me believing that he actually felt I had a unique spot to play at DRC cause I spun several formats intertwined within one shift on the overnights which had a huge combined am/fm audience and he'd just tell me that. Charlie would call me up sometimes too at three or four in the morning and let me know he dug a segue, enjoyed the news and the goofy kicker I found, or he'd just call to say hello and let me know he was listening and paying attention to what I was doing there. In our in-office conversations Charlie'd just suggest I consider stuff - "turn down your cans" - "be aware of your different audiences" - the factory people, the hamburger stands, the nurses and party animals, those who got up real early..etc etc. and he challenged me to make the flow invisible. I would start at midnight bringing two dynamically opposite stations together then blaze along as some sort of weird hybrid rockin out with AC/DC and Robin Trower till about 4 am yet by morning I'd have Paul McCartney singing love ballads...and I enjoyed it. 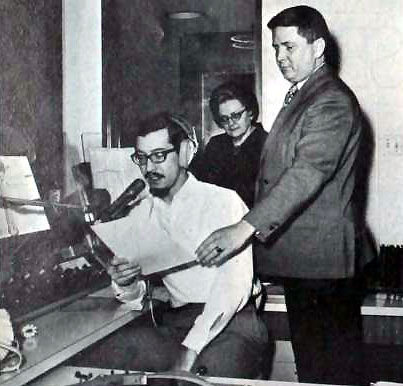 Porter look on as midday host John Rode reads a piece of copy. together - and I mean with 1 or 2 seconds difference between our two programs - so that if you switched back and forth between the stations you'd be in the same line of the song. We did this just for fun and because we could and we'd always been great friends and we figured that it would be fun and no one would ever catch on. Well Charlie did. And the night he called me about it he let me know very simply that I "should not do that anymore" but that he had enjoyed the first five or six times he'd heard it. Funny too, I do remember the first time that I finally figured out how Charlie worked. He planted seeds in conversations. These seeds would lie dormant for a week or so and then suddenly take root, grow and blossom all at once. I'd come up with something! or I'd think of some way to change my delivery! I'd come up with a bit...and... Oh - No! - I'd realize all of a sudden that Charlie had prodded me to this idea a couple weeks back. Charlie's seed had blossomed. And often it was one of those "Duh" kind of things. Charlie was a good guy. I remember years later talking with Lee Michaels (of the Lee Abrahms bunch - he's now deceased also - hit by another car while backing out of his own driveway...) about Charlie. Lee admired Charlie tremendously and credits a couple conversations he'd had with him at NAB conventions with pointing him in certain directions. I remember when I first got the offer to come out to Hawai`i and I went to talk to him about it. I was very nervous and a little ashamed. 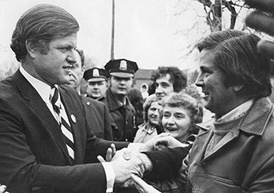 Ted Kennedy meets WDRC's Charlie Parker. I mean I was leaving BIG D on my own accord. But Charlie, he was thrilled for me. I remember him grabbing my hand to shake it furiously while beaming from ear to ear with that Charlie Parker Cheshire Cat Grin. He thanked me for all my hard work and told me on the Q.T. that the FM format wouldn't be around too much longer and that my leaving was quite fortuitous cause all us rockers (including yours truly) were practically scheduled to be fired somewhere in the next four or five months. Read more comments on Charlie Parker from Bill "FM" Stephens and Jack Lawrence. Charlie's children, Kathy and Steve.